The New Orleans Saints were coming off back-to-back losses and had a 2-5 record as they hosted the Los Angeles Rams on October 23, 1994. QB Jim Everett had come over from the Rams in the offseason and was doing well, but the running game was ordinary and the defense, once the team’s strong point under Head Coach Jim Mora, was now a liability. 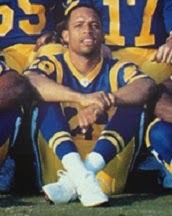 Tyrone Hughes (pictured above), a Pro Bowl kick returner who led the NFL in punt returns in ’93, would be making his first start at cornerback. The Rams were struggling at 3-4 under Head Coach Chuck Knox. RB Jerome Bettis led the running game and QB Chris Miller was capable – when healthy. Rookie WR Isaac Bruce had been a pleasant revelation, but LA’s defense was also highly suspect. There were 47,908 fans in attendance at the Louisiana Superdome. Tyrone Hughes returned the opening kickoff an innocuous 17 yards and the Saints drove 77 yards in nine plays. Jim Everett, appearing against his former team for the first time, started hot and completed passes to WR Torrance Small for 16 yards and WR Quinn Early for 11 while WR Michael Haynes gained 12 yards on an end-around. 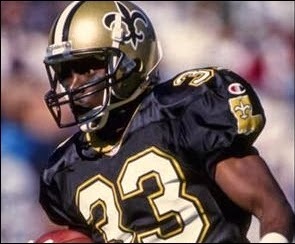 The series concluded with RB Derek Brown running the final three yards for a touchdown and Morten Andersen added the extra point. The Rams punted following a short possession and New Orleans again drove to a score. Along the way the Saints converted three third downs, all on Everett passes, as they again went 77 yards, this time in 10 plays. The big one resulted in a TD as Everett connected with TE Wesley Walls from 30 yards out. Andersen again added the PAT for a 14-0 lead. WR Todd Kinchen returned the ensuing kickoff 47 yards and that seemed to invigorate the Rams offense as Chris Miller threw to WR Willie “Flipper” Anderson for 23 yards to the New Orleans 30. Another pass completion was followed by two short Jerome Bettis carries before, on the first play of the second quarter, Miller threw to Isaac Bruce in the end zone for a 19-yard touchdown. Tony Zendejas added the extra point and the home team’s lead was cut to 14-7. Hughes returned the kickoff 23 yards and the Saints made it to their 46 before having to punt. However, they got the ball back quickly when, on the next play, Miller’s pass was deflected and intercepted by Hughes at the LA 12. New Orleans wasn’t able to reach the end zone, but Andersen booted a 21-yard field goal to make it a ten-point game. Once again the Rams turned the ball over when CB Jimmy Spencer intercepted a Miller pass at the Los Angeles 42 and returned it to the 31. Everett went for the score with a bomb intended for Haynes on the first play, and while it fell incomplete the Rams were flagged for pass interference. With first-and-goal at the one, it seemed as though the Saints were on the verge of taking control of the game. But on the second play, RB Lorenzo Neal fumbled and SS Toby Wright picked up the ball at the two and returned it 98 yards for a TD. Zendejas added the extra point and suddenly, what had appeared to be a rout in the making was now a three-point contest at 17-14. The Saints struck back with equal suddenness. On the ensuing kickoff, Hughes pulled in the kick at his eight and returned it 92 yards for a touchdown. Andersen’s successful conversion again made it a ten-point margin for the home team. LA responded with a 33-yard drive in six plays following Kinchen’s 33-yard kickoff return. Miller connected on back-to-back passes to Bruce for 25 yards and also had a 10-yard run on a third-and-12 play. It set up a 47-yard Zendejas field goal and the New Orleans lead was cut to 24-17. Hughes returned the next kickoff 31 yards but the Saints failed to move and punted. The Rams backed themselves up with penalties on their next series and Sean Landeta’s 55-yard punt was returned 25 yards to midfield by Hughes. With just 48 seconds remaining in the first half, Everett passed the Saints into field goal range and Andersen obliged with a successful kick from 40 yards to give New Orleans a 27-17 lead at the intermission. The Rams started the third quarter with a new quarterback in place of the injured Miller, Chris Chandler. Their first series was a short one that resulted in a punt, which Hughes returned 13 yards before fumbling. Small recovered for New Orleans at his 35, and from there the Saints advanced 46 yards in 10 plays. For the most part, they kept the ball on the ground with Bates and Brown carrying, although Everett added a pass to Walls for 28 yards to the LA 30. Andersen capped the drive with a 37-yard field goal and the New Orleans lead was extended to 30-17. Los Angeles responded with a long 15-play, 55-yard possession. Nine of the plays were runs by Bettis, who gained 41 yards, including one yard that converted a fourth down. Chandler completed one of his four passes and Zendejas kicked a 32-yard field goal. The 30-20 score didn’t last long when, on the kickoff that was also the final play of the period, Hughes again returned it all the way for a touchdown, this time covering 98 yards. Andersen made it a 37-20 contest entering the fourth quarter. The teams traded punts before the Rams put together a scoring drive. A long completion on the first play was called back for offensive pass interference, but Chandler hit on four of his next six passes and RB Johnny Bailey ran for a seven-yard TD. The Saints followed up with a series that consumed 4:32 and reached Los Angeles territory. The drive finally sputtered out at the LA 39 and Tommy Barnhardt punted, but now it was time for the Rams to make a big play on a kick return as CB Robert Bailey (pictured at right) ran it back a record-setting 103 yards for a touchdown. No one had downed the ball when it sailed into the end zone, looking as though it would pass on through, but it bounced back and sat live and untouched. While Saints players complained that the ball had hit the end line and they heard a whistle, Bailey’s quick thinking as he picked up the live ball and took off was rewarded and Zendejas added yet another successful conversion. With just under four minutes remaining in regulation, the once seemingly comfortable New Orleans lead was cut to three points. The Saints were able to get a first down on their next series as they ran the time down to 34 seconds before punting. Johnny Bailey returned it 14 yards to the LA 40, but Chandler was sacked on the next play and then threw a pass that was intercepted by CB Selwyn Jones to effectively end the contest. New Orleans won by a final score of 37-34. It was certainly a game made memorable by big plays – there were four touchdown returns of over 90 yards. The Saints outgained Los Angeles (314 yards to 242) and had more first downs (18 to 13). The Rams also turned the ball over three times, to one suffered by New Orleans, and were penalized 9 times, at a cost of 84 yards, to five flags thrown on the Saints. Tyrone Hughes set a NFL record with 347 yards on combined kick returns, with 304 on 7 kickoff returns and 43 on three punt returns. The previous single-game record for return yards was 294, held jointly by Detroit’s Wally Triplett in 1950 and Woodley Lewis of the Rams in 1953. Hughes also broke Triplett’s record of 294 yards for kickoff returns alone with his 304 yards and he became the fourth player to return two kickoffs for touchdowns in a game. Jim Everett completed 17 of 26 passes for 206 yards and a touchdown with none intercepted. Derek Brown rushed for 86 yards on 26 carries that included a TD. Quinn Early and Michael Haynes each caught four passes, for 40 and 36 yards, respectively, while Wesley Walls had the most receiving yards with 65 on three receptions that included a score. For the Rams, Chris Miller, before leaving the game with a concussion, was successful on 7 of 11 throws for 88 yards and a TD, but with two interceptions. In relief, Chris Chandler went 7 of 17 for 74 yards and was intercepted once. Jerome Bettis was held to 63 yards on 18 carries. Johnny Bailey had four catches for 36 yards while also running the ball once for a seven-yard touchdown. Isaac Bruce and Willie Anderson each gained 44 yards on three receptions, with Bruce having a TD among his. Lost in Tyrone Hughes’ heroics was a fine kickoff returning day by Todd Kinchen, who averaged 32.8 yards on his four returns. Also overshadowed was Robert Bailey’s record 103-yard punt return – the only one of his 11-season NFL career. The Saints continued to struggle, losing three of their next four games, and finished second in the NFC West with a 7-9 record. The Rams, in their final season in Los Angeles, were last at 4-12. Tyrone Hughes led the NFL in kickoffs returned (63) and yards (1556) although his 24.7 average ranked ninth. His 6.8 average on 21 punt returns was only half of his NFL-leading 13.6 of the year before, but he did lead the league in non-offensive touchdowns with four (two on kick returns, two returning fumbles).